The Wanteds are the brainchild of singer-songwriter Tommy Harrington, whose former rock outfit, No. 3 Breakdown, disbanded and sent Harrington to the basement. 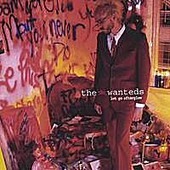 It was there he went to work on a collection of cathartic, personal songs about his own failed relationships and general turbulence in his life at the time, morphed into what would be Let Go Afterglow, the debut of The Wanteds. From the heart-on-the-sleeve, rhythmic early morning pop of "Can't Say No" to the bare-bones acoustic guitar and voice of "Bored", Harrington turns depression into an art form, delivering stark honesty in lines like, "I can't say no, that is my problem. I think that I'm not good enough," which opens the album. Or, "I know I'm talented, but it doesn't mean I'm immune". It is this look at one's self that propels Let Go Afterglow, and makes it the self-exploration that helped Harrington, and turned it into a solid indie-rock record with some grit and jangle, balancing the two quite nicely. Harrington has proved to be a more-than-capable songwriter with lyrics that would impress any emo fan, but a voice and musical style that avoids emo in favor of straight-forward indie-rock with nice detours into pop territory. I'll give it a B.